For my 13th villain, I picked Count Olaf of the 13 unfortunate events. After a long day's work of burning down carnivals and hotels, Olaf just wants to enjoy a pleasant dinner with the kids. Look, Sunny prepared a roast all by herself! 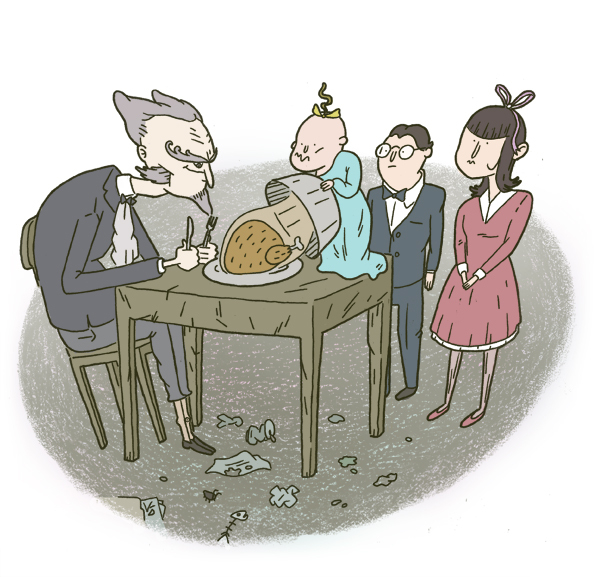 Brett Helquist, the illustrator of Lemony Snicket's genius series, is one of my favorites. This is my shameful attempt at paying homage. Labels: Give Em a Break!, Illustration, V.F.D.